You know what this tree reminds me of? When I was a little girl, I remember a book at school which was about magical seeds (or was it the magical ground? ), where whatever was planted in that garden, a corresponding tree would grow. For example, if a hat was buried, a tree with hat fruit would grow, if a feather was planted, a feather tree would grow, and even, if money was planted, a money tree would grow. (Now wouldn’t that be nice!). I can vaguely picture the book… Cute illustrations and these colours remind me of the story as well. There may even have been an Easter tree. A search on google didn’t help me find it, but the book was around in the 80’s when I was little… I’m not sure when it was published, but if you know the book I’m talking about, I would love if you would indulge my nostalgic ramblings and share what the name of it is. 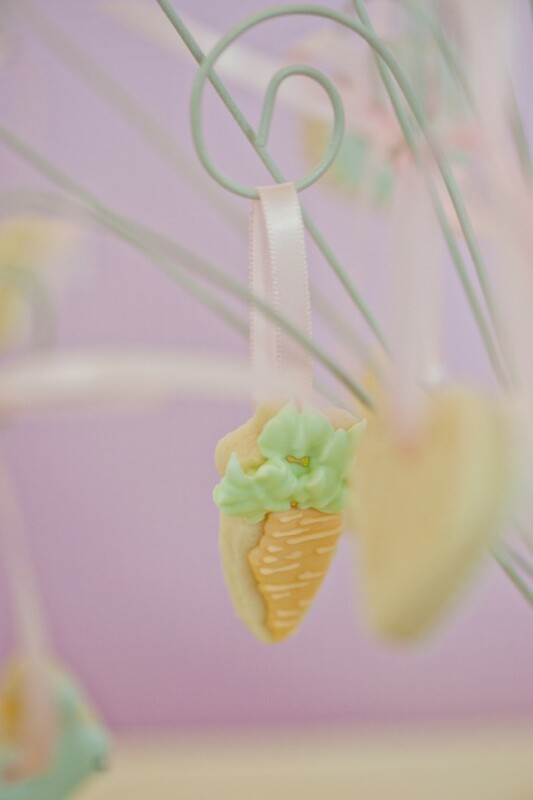 It would have been a lot faster to pop one of these cookies in the ground and come back the next day to see this Easter tree there. No, really… they weren’t hard to make. The part that took the longest was threading the ribbon through the tiny hole and tying little ribbons. I forgot to make little holes in some of the cookies, and some of the holes were too small, (note to self – make them about 1/2 cm next time), so I had to adhere the ribbon to the back with icing. If you decide to make these, I used a barbeque skewer to make the holes in the dough before I baked them. And decorated them with royal icing, white non-pareils for the bunny tails, and black edible marker for the bunny eyes. Thanks to The Flour Pot Cookie Book for the ribbon idea. They were the perfect little covering for the holes. What can you use this Easter tree for? (Besides eating of course). 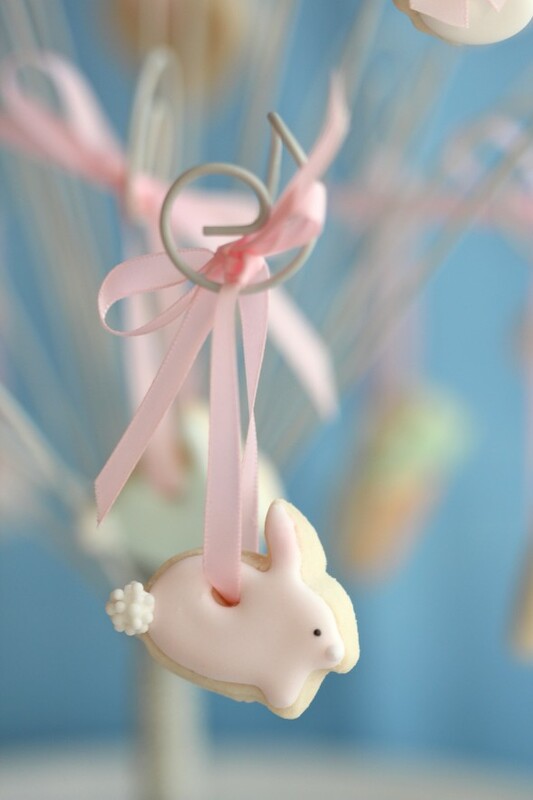 A cute centerpiece for Easter is one idea, and another – We’ll be putting it at the top of a cupcake tier for a charity event my classes are hosting in April. They won’t be edible by then though, especially as I made these in late January for the on-line magazine My Little Jedi. I was thrilled to be asked to contribute to their Autumn issue (Australian). 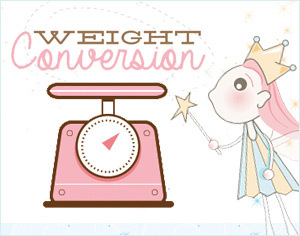 Vesna, the editor in chief, has created my absolute favorite on-line magazine around. When I saw the first issue, I’m pretty sure I literally gasped at all the loveliness. I love Vesna’s creativity and style, love the work her contributors have shared and am thankful to be included as one of them in her 3rd issue here. You can find more gorgeousness over on Vesna’s blog as well. Have fun baking, browsing and pinning! 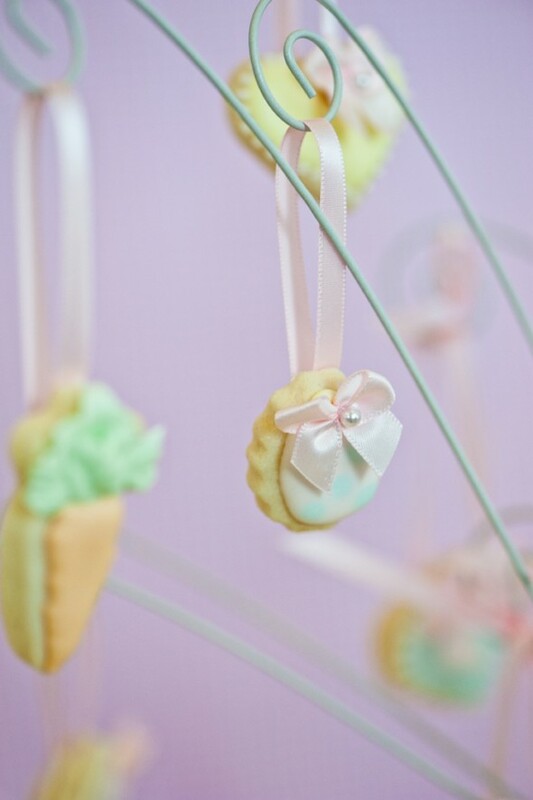 super cute, and I always look at those trees at Micheal’s, and always think I will never use it, but if I put cookies on it how fun! Absolutely beautiful! Where did you find the tree? 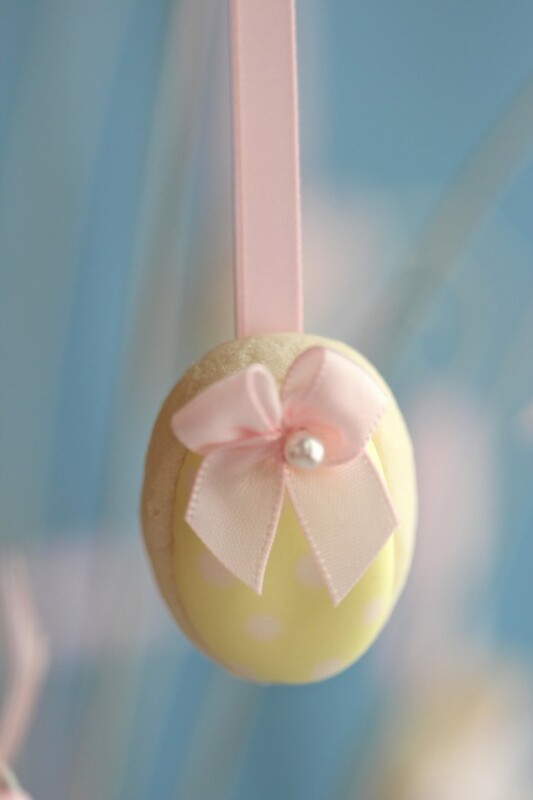 This is super cute and would make a beautiful centerpiece for Easter. What a great idea! I’m sorry but I don’t know that book. What a wonderful idea. 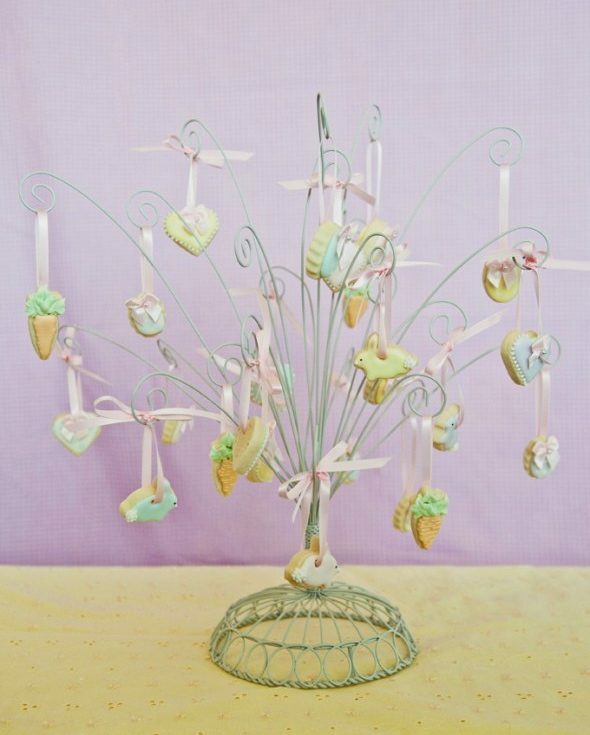 Your cookie tree idea can be used for any special event or Holiday! Congratulations on the magazine feature Marian. 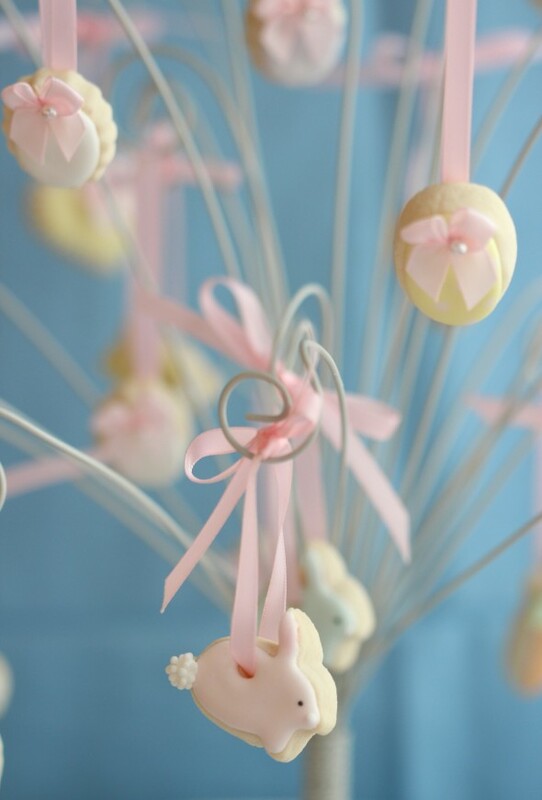 This edible Easter tree is so, so pretty. I love all the teeny cookies and your colour choices are just perfect for the season. we did something similar for christmas one year. It was a christmas away from home and so for all our ornaments we made sugar cookies and hung them from the tree. It was so fun to just grab one off the tree whenever we wanted to eat one! Absolutely adorable! YOu are amazing! That is one of the sweetest things I’ve ever seen! That tree is just completely delightful! What a wonderful showpiece for the Easter table. I love the fluffy bunny tail on the little bunny! so beautiful!!!! I love it!!! 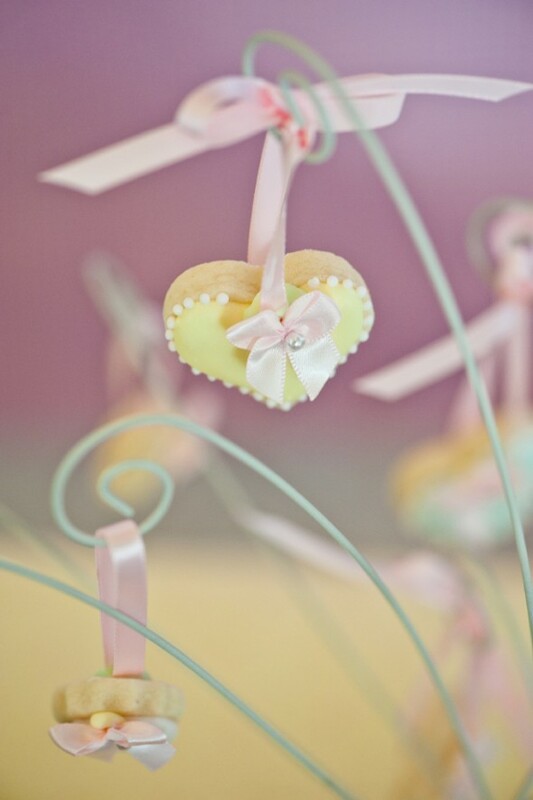 What petite and precious little cookies! Perfect Easter centerpiece! how beautiful and cute….I love your colour combination. It does feel like spring…exellent post again. I dont know that book you are looking for. So sweet! I love your bunny tails. 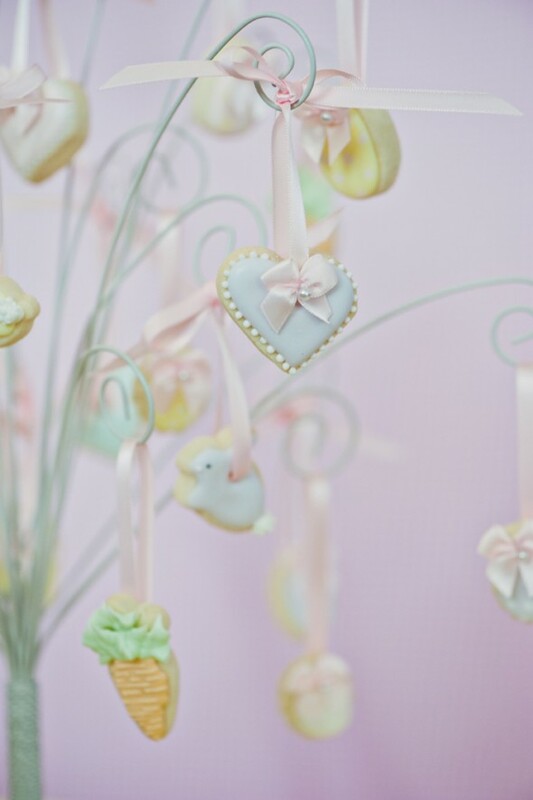 I grew up with an Easter tree with treasured spring ornaments. They’ve inspired a few cookie creations for me, but never a whole tree! Too cute! I am in love! Oh my! These are incredibly cute, adorable and amazing. Beautiful. I’m loving how you’ve displayed them all too. Impressive work yet again. Super cute! Where did you get the “tree”? I’d love to get something similar for our upcoming wedding. Hi @ Janette: It’s from Pier One. They also have a really cute green one now which looks more like a real tree. Wondering if you can recommend someone who can make/bake these for me? Love to bake but I have no decorating skills! Thank you! Or at least where I can buy the cookie cutters? To give it a whirl!! These definitely give a whole new meaning to the word “Cute”, how can anyone dare eat them? Congratulations as always on your work and specially on your article in the magazine! You must be so proud, I as your reader certainly am. Happy Sunday! @ Katie: I honestly don’t remember where I bought those mini cutters from… it’s been years of collecting cookie cutters, and some I remember where I bought them from, and some I don’t. A search on google should help. If you would like someone to make them for you, click on the banner on the right hand side of my blog, which says, ‘Want to order some sweets’, and it will take you to a page of talented decorators. I love, love, love this tree. Where did you get the wire tree? It would be the perfect gift for my daughter-in-law. Yes I am a Marian too. The correct spelling for a woman as you well know. The tree is from Pier One Imports, and they also have a really cute light green one, which looks more like a tree. Have fun shopping! Oh Marian, I had the best day today. I went to our local Pier 1 and was able to purchase the wire ornament tree. I am going to bake some gingerbread cookies and see if I can come up with something a little different. It’s for my daughter-in-law. Also got to go to a wonderful candy store in Baltimore. The company name is Rhebs and they have been making candy in the basement of their house forever. I don’t know if you ever watched the I love Lucy reruns, but if you did the episode where Lucy and Ethel get a job in a candy factory was filmed at Rhebs. What a hoot. Anyway I just want to thank you telling me where to find the wire tree. Have a wonderful week-end. I still feel funny writing to ‘myself’ hee hee. Hi @ Marian, I’m so glad you had a great day! I can’t wait to see the photos of your tree with your cookies (please, pretty please share them somehow… not sure which social networks you like? Fb, flickr, instagram or Pinterest? Or am I missing one? Lol). I did watch I love Lucy reruns, but don’t remember that one – will watch out for Rhebs candy from now on! Have fun decorating and enjoy your weekend too! 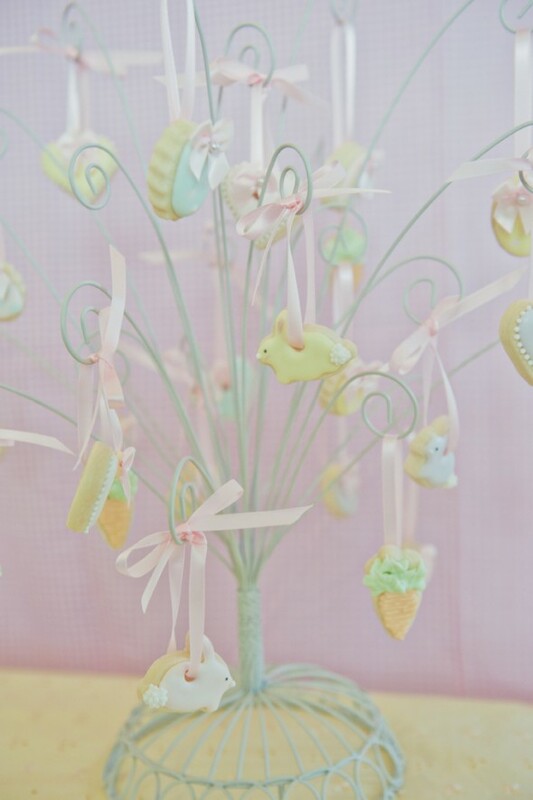 Love your Easter (mini) cookies on the cute tree. Inspired me to order my supplies and make them for the holiday. Thank you for sharing. I will post once I’ve made them. Looking forward to seeing them @ Peaches in Ohio! Oh this is so cute! You are so talented! My little sister would love this!